As mentioned previously, in researching paint schemes for my scale test car I decided to paint my all-black model. So yesterday I gave my scale test car a coating of CNR mineral brown (the colour used on CNR boxcars, also known as CNR Red #11). It looks too bright – more orange than mineral red – but that’s the way my chosen paint goes on. Experience tells me that with a light weathering treatment it will tone down to a browner look that’s more appropriate to the prototype. To see what I mean, check out the “CNR Boxcars” category on this blog, and note the difference that weathering makes. First, I wanted to keep the paint off the wheels but did not want to disassemble the unit. I made up the masks shown by cutting them out of notepaper. I folded the paper and used the fold as the centreline to freelance the slots for the wheels with a pair of scissors. When I unfolded the paper, I had a nice U-shaped slot to slide over the axle between wheel and horn block. Note that I didn’t try to make the masks for both ends of the axle from a single piece. Instead, I cut pieces for each wheel, and left enough paper that they would overlap under the car. I fitted the pieces, then taped them together. The weight of the car kept them trapped between the model and the much-abused plastic Lazy Susan that I use as a painting platform in my spray booth. Second, a lament for lacquer-based paints. The paint I used was made by Scalecoat for the CNR Historical Association, and it’s awesome stuff. I airbrushed this model directly over the black paint it wore from the factory. The paint covered 90% of the black in the first coat and by the time I sprayed the other side I was able to go back and shoot a top coat to cover the rest. What’s more, the gloss finish will be perfect for applying decals. Following the notes on scale test cars found on the White River Division blog by George Dutka, I’ve emailed Andy at Andy W. Scale Models to find out more about his CNR Scale Test Car decals. These are HO scale, but I’m hoping he prints these himself and can do a couple of sets in S for me. If not, well, I’ll just have to buy the HO ones and see what use I can make of them. 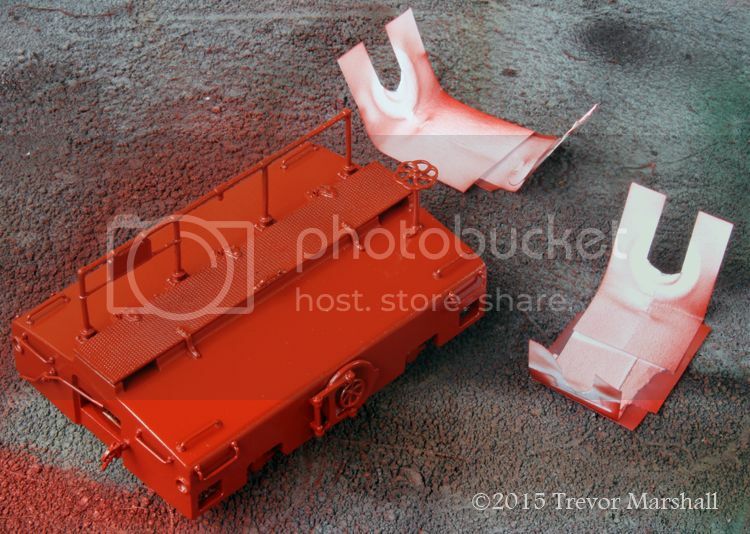 This entry was posted in equipment, Non-Revenue, Scale House and Scale Test Cars by Trevor. Bookmark the permalink. Scalecoat paint has been purchased by Minuteman Scale Models and will continue to be available. That’s true, although the CNR-specific colours were done for the Historical Association and may not be renewed. Also, we have increasing trouble getting lacquer-based paints like Scalecoat here in Canada. Part of the issue is labelling: we have different requirements than in the USA, which is causing issues at the border. As a consequence of this and of the reduction in the number of people who actually paint models in the railway hobby, hobby shops are carrying less lacquer-base paints. In some cases, they’re simply announcing that it’s no longer available. Military modelling shops still carry a lot of it though – but not in traditional railway colours. I also expect that at some point, tougher regulations on VOCs will force lacquer-based paints out of the hobby – not because they’re more dangerous than acrylics (if they’re used correctly), but because they’re not used correctly. Sorry, I forgot about the customs issues, the grand effort to protect us from ourselves. Actually the latest labeling on Scalecoat won’t help either. I just picked up several bottles from a shop in Michigan last week and the owner was complaining that parents shun it because they don’t want to harm their children. The label reads: “DANGER !, flammable, harmful or fatal if swallowed, vapor harmful.” The ‘color’ is much harder to read because the font is smaller than the other lettering. Recently I had a lot of trouble finding primer, so I went to an auto paint company and bought a quart of a nice gray lacquer primer and mixed up my own supply in small bottles. I guess it’s now a matter of securing what we need before the EPA slams the door shut. And yet, acrylics would be just as bad if swallowed. Soon, paint bottle labels will read, “always wear a bike helmet when using this product”. To be fair though, a lot of these warnings, etc. are there for a reason. Yes – the products are dangerous. So are a lot of things. It’s better, I think, to learn how to use these things properly than it is to just run from them. Red 10021/20021 to be a slightly warmer version of CN Red #11. So even if the new makers don’t produce the CN Lines CN Red #11, all is not lost. I’d add that a “close-enough” colour is perfectly acceptable on any car other than factory-fresh.as an example, I notice a real shift in the colour on my CNR boxcars from before weathering to after. An oxide red car would just look like it had been in service for a while – and a bit of variation in the fleet is a good thing. The other issue for us in getting solvent based products is shipping across the border. The common carriers, USPS, Canada Post, UPS, etc under newer regulations can not carry said goods across the border without an additional level of training and expense for the drivers. Another money grab by the authorities. The model railroad distributors, like Walthers, won’t explore alternatives for cross border shipping. And yet I can get solvent based products from the better plastic model stores. Go figure. Nothing upsets me more than hearing from ill informed hobby shop attendants that they “can’t get that anymore”. It’s because they won’t explore options. Looks great, can’t wait to see it finished! Thanks Matt – me too! No need to re-weigh: I’m using special Fairy Dust paint and it’s weightless. Nice model. Thanks for showing the paper masks; neat idea. My pleasure, Gord. They took about five minutes to make and saved a lot of trouble. I’ll likely make more when I apply the clear finish coats over the decals. There is always the George’s Trains Proto-Paint Line and yes it is acrylic-based but it does have Canadian colours. Good point, Nelson – and thanks to George’s Trains for ensuring Canadian modellers have a source for correct colours. I’ve yet to try these – I’ll exhaust my stock of Scalecoat CNRHA colours first. Another thing: they mostly dry with a gloss coat!